This book was published in 1981 and updated for 2012. It is still the definitive book on how to stay calm under stress, think better, feel better… and win. All sports are covered including boxing, baseball, swimming, basketball, tennis, soccer, football, rowing, figure skating, and of course Track & Field. Turn your most stressful situations into moments of peak performance. Based on mental and physical training methods he used to prepare flyers for combat and coach record breaking track stars, presents a thorough plan that teaches how to be calm under pressure, discover new energy, increase concentration, learn faster, improve physical coordination and self-confidence. 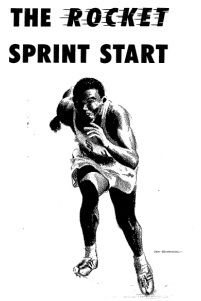 Originally published in 1956, and revised in 1973, this ground breaking, best selling book still remains the Gold Standard for coaching sprinters. 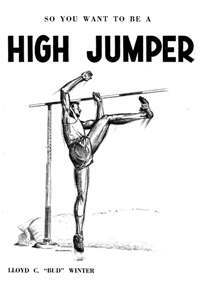 The original two versions were used to train many Olympic medalists and world record holders. The new 2010 edition combines the best of both versions and includes detailed training plans for full time year ’round athletes, and one for multi-sport athletes beginning training in January. 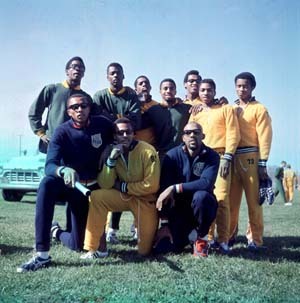 The training plans that are in the book are the same ones used by TOMMIE SMITH, JOHN CARLOS, LEE EVANS, RONNIE RAE SMITH, all Olympic medal winners and World Record holders that Bud Winter coached. Anyone who saw Armin Hary of Germany at the Olympic Games will agree on two facts: one, he was one of the fastest starters of all time, and two, his pickup in the first 20 yards was amazing. A careful film analysis of Hary’s form, taken from hundreds of slow motion pictures of the 1960 Olympic Games, revealed seven ways in which his form differed from the form of the rest of the sprinters. Bud Winter at Speed City field tested these idiosyncrasies and found in each case they were all a definite contribution toward faster block clearance and faster pickup. With all the problems the USA team is having with relay passes, you have to wonder why they don’t go back to basics? While most track and field coaching books dedicate a few paragraphs on relay passing, this 38 page book is an entire book on the relay pass. The original book was printed in 1964 and a new edition will be re-released in 2013. Sign up for the Newsletter and be notified when it will become available. This book was originally published in 1958, 10 years before the Fosbury Flop became a household name (or Brill Bend, depending on who you ask). It covers the two basic techniques at the time: the Western Roll and the Straddle. 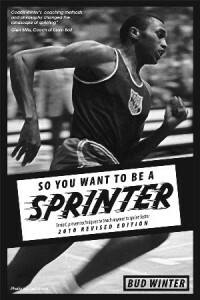 It includes a year round training plan with daily detailed workouts similar to So You Want to be a Sprinter. Like all his books, he covers the topics in a simple, concise yet humorous style. Sign up for the Newsletter and be notified when the re-release will become available.